Educator and business owner Laura Klein is on a mission to transform bedtimes and sleep for every Australian family. March 15 is World Sleep Day, and the statistics on sleep are worrying. Research by the Sleep Health Foundation has found between 33 and 45 per cent of Aussies have poor sleep patterns that lead to fatigue and irritability that's putting them at risk of low productivity, damage to their mental health and unsafe behaviours. And children are part of that statistic, with bedtime battles and night wakings pushing Aussie parents to the limit. An overload of screen time and a high sugar diet is also contributing to children and teens being too wired and stimulated to sleep. The recommended nightly sleep quota for children is between 10-13 hours. Parents of newborns and babies under 12 months are surviving on broken sleep and unpredictable nap and night sleep routines. Sleep deprivation for new parents can cause anxiety, pre and post-natal depression, irritability, relationship problems and more. Whilst there is always a level of sleep disruption when bringing a new baby home, some nurturing sleep strategies, positive sleep associations and gentle routines can be implemented from birth, to give babies the best chance to settle into a familiar and healthy sleep pattern. Laura is a teacher and CEO of snottynoses.com.au. She works with a team of sleep consultants, including Little Ones and The Sleep Dept and has been involved in the design of the newest sleep aid to enter the Australian market. The Aroma Snooze 6 in 1 Sleep Aid is a humidifier and aromatherapy diffuser with built in sound therapy and red light therapy. "This is a game changer", says Laura. "It's the combination of these features that is scientifically proven to create a calm, consistent sleep environment, and parents are loving it for their babies, toddlers and even teenagers. Watch the video and read the testimonials here. Bedtimes do not need to be a battle, and sleep consultant Erika Lamour suggests that after dinner and a bath, there should be a consistent set of steps that last between 10-30 minutes to get your baby or child into bed, drowsy but awake. From there, they drift to sleep themselves. This ability to self settle is a key factor in positive sleep patterns. There is no place for a "cry it out" strategy for little ones still learning to self soothe. Our experts can guide you through the age-appropriate, specific steps that form part of a whole sleep strategy. Even 10-16 year olds need a consistent, screen-free wind down before bed each night. Children, especially toddlers, are masters at distraction and stalling the final goodnight. Check out our 8 best bedtime tips here. Research also says that a cuddle blanket or sleep buddy provides tactile comfort to your baby or child. SIDS guidelines recommend a washable, organic, cotton cuddle blankie is best - not a plush toy, or fluffy blanket which could be a choking hazard and gather a lot of dust and allergen particles. 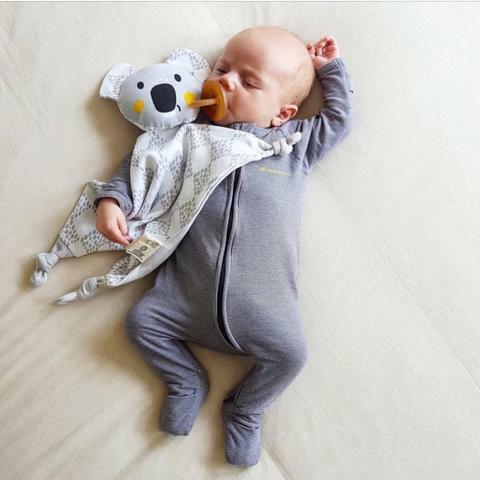 The Kippins range is Australia's most popular organic cotton cuddle blankie and is helping little ones settle to sleep and stay asleep for day naps and night sleep. Sleep is not a luxury it's a necessity. Children who get enough sleep are happier, healthier and smarter. You may feel as though your baby or toddler or child will never be able to change their current negative sleep behaviours, but it's worth investigating the support and gadgets available that can help. Take the opportunity on World Sleep Day to implement some gentle, positive sleep changes and give your whole family the gift of sleep. We'd love to support your sleep journey.